The University of North Carolina System Office recently announced record increases in enrollment at the graduate and undergraduate levels, and recent studies have highlighted the rising value of both undergraduate and master’s degrees. For education above the master’s level, however, the picture is less clear-cut. The media tends to paint a bleak picture of the current market for academic or research-based doctorates (most commonly the Ph.D., but also many others, e.g., Ed.D. in education, D.F.A. in fine art, D.P.H. in public health, D.S.W. in social work), while ignoring professional or practice-based doctorates (e.g., J.D. for lawyers, M.D. for doctors, Psy.D. for practice-oriented, rather than research-oriented, clinical psychologists). Academic and research-based doctorate holders play a critical role in society by working on cutting edge research toward solving pressing issues, making key discoveries, moving their fields forward and influencing available knowledge on a topic, or producing economically important innovations. The overall U.S. academic job market for Ph.D.’s, however, has been described as “dismal.” While more data are needed to identify where Ph.D.’s and other research doctorate holders are currently being placed in the short- and long-term, the share of tenure-earning academic positions available for these graduates has been declining. In the broad fields of science and engineering, the National Science Foundation reports greater percentages of research doctorates finding work outside of academia, or in non-tenured academic positions, than in the past. Outside of science and engineering, the proportion of research doctoral recipients with work lined up upon completing their degree is at a 20-year low. Within the UNC System, an “accelerate to industry” program at NC State has been rolled out to help advanced academic doctoral students, postdocs, and Ph.D. alumni transition to pursuing a career in industry, rather than academia. At UNC-Chapel Hill, a “Versatile PhD” resource is available for PhDs in the humanities and social sciences to explore and prepare for non-academic careers. The market for practice and professional doctorates, such as the M.D. or J.D., less commonly finds its way into these conversations. Figures 1 and 2 show enrollment and graduation patterns for both academic/research and professional/practice doctorates conferred by the UNC system. Both types of programs had an overall increase in graduates over time (looking from the years 2010/2011 to 2014/15). However, Figure 1 shows declining enrollment in academic/research-based doctoral programs, while Figure 2 demonstrates a progressive increase in the number of professional/practice-based doctoral students enrolled during this time period. 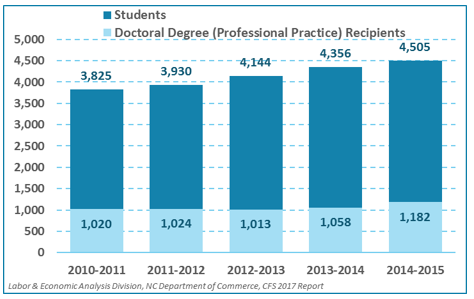 Following graduation from the UNC system, many research and practice-based doctorates become employed in North Carolina. While we cannot track graduates with out-of-state employers, or in positions that do not contribute to Unemployment Insurance (such as contingent academic appointments, federal employment, self-employment, and other work not covered by state UI laws), Figures 3 and 4 show the employment trends within North Carolina for each of the graduating cohorts. 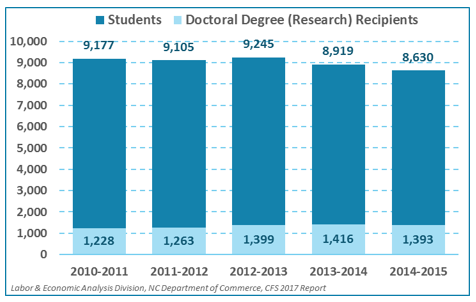 Consistent with the academic career path, academic doctorates’ employment within North Carolina (Figure 3) decreases each year following graduation. The academic hiring process typically requires a nationwide or international job search, and many of these graduates likely moved to other states to enter postdoctoral or professorial appointments. 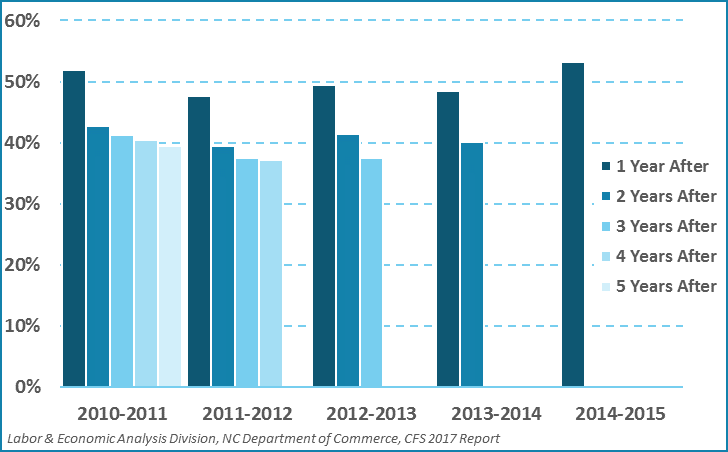 The annual declines in academic doctorates’ North Carolina employment also strongly suggests that their initial appointments or jobs were term-limited. 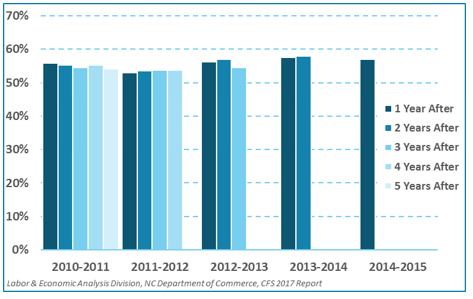 In contrast, professional practice doctorates see a relatively stable level of employment within North Carolina over time (Figure 4). 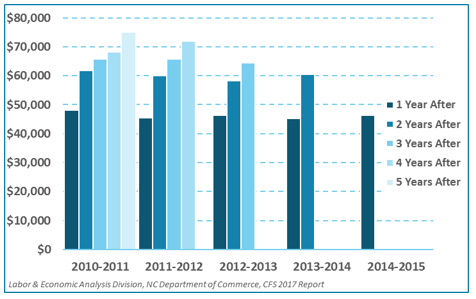 While many graduates may have moved out of state to find initial employment, or may even have enrolled in further study, their rates of employment in North Carolina are relatively stable over time. This pattern is consistent with the expectation that a professional practitioner (of law, dentistry, nursing, etc.) would join a practice and perhaps stay rooted in that locale. Finally, there were both differences and similarities between the wage outcomes of these two groups. Figures 5 and 6 show that both types of doctorates who have found UI-eligible positions in North Carolina can reasonably expect to see wage growth in the years following their degree. However, for research doctorates, wages at comparable levels of experience do not appear to have risen over time. One year after graduation, 2014/2015 research doctorates were earning slightly less than newly minted research doctorates four years prior. For professional practice doctorates, though, new graduates in 2014/2015 fared better than those in 2010/2011. 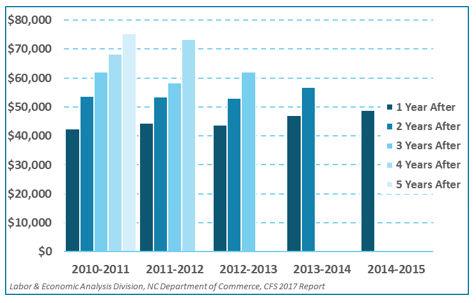 However, additional years of data are needed to determine whether increases in median wages across cohorts in North Carolina are limited to initial wages (in the first few years after graduation), or if this trend continues into more advanced levels of employment. National data indicate that professional doctorates do have higher wages and lifetime earnings than PhDs, but that all doctorates (research or professional) have higher earnings, and lower rates of unemployment, than any other type of degree. Overall, for those doctorates who do find qualifying employment in North Carolina, the type of doctoral degree does not appear to matter strongly for post-graduation wages (and earning a Ph.D. has its own non-monetary rewards, such as intellectual growth, nurturance of creativity and critical thinking, and a stimulating environment). The challenge for North Carolina, and for other states, is to continue to respond to the changing academic market by sufficiently preparing, supporting, and training research doctorates to pursue sustainable rather than contingent positions both within and outside of academia.